Copyright © The Writers Post 1999-2010. TRUONG BAO SON has died at the age of 94 on May 23, 2010. Truong Bao Son, real name Truong Cam Binh, is a Vietnamese writer who was born on March 03, 1916 in Ha Noi, North Vietnam. He started in the literary community in 1946, worked for the Hanoi based daily newspapers Viet Nam and Chinh Nghia as a staff-writer. In 1957, he collaborated closely with Nhat Linh in co-founding the publishers Phuong Giang, Doi Nay, Quoc Bao, and in publishing the literary monthly Van Hoa Ngay. In 1959 he was the publisher of Tan Phong magazine. After the collapse of South Vietnam in 1975, he escaped Vietnam by sea to Pulau Bidong (Malaysia) in 1978, and resettled afterwards in 1979 in Canada. After living in Canada for many of the following years, he resumed his writing and freelanced for numerous journals and magazines abroad, including Van Nghe Tien Phong (US), Lua Viet, Vuot Bien, Nang Moi (Canada), Doc Lap (Germany). In 1988, with Nguyen Khac Ngai and Do Quy Toan he established the Vietnamese PEN Abroad Canada. Truong Bao Son is not only a writer, but also a translator of world literature into Vietnamese language. His volumes of translation include Tinh Nghia Vo Chong, translation of “Le Bonheur Conjugal” by Leon Tolstoy (VN: Phuong Giang Publisher, 1961, second edition 1968), “Con nai to”, translation of “The Yearling” by M. K. Rawlings (VN: Phuong Giang and Tin Duc, year (? ), third edition 1966), “Mot ban dan”, translation of “The Kreutzer Sonata” by Leon Tolstoy (VN: Doi Nay, 1961), “Gio Dong Gio Tay”, translation of “East Wind, West Wind” by Pearl S. Buck (VN: Bon Phuong, 1968), “Ngu ong va bien ca”, translation of “The old man and the sea” by E. Hemingway (VN: ? ), “Dinh Gio hu”, translation of “Wuthering Heights” by Emily Bronte (continued the translation work left behind by the late writer Nhat Linh; VN: Publisher (? ), 1971), “Chiec la cuoi cung”, a collection of short stories by world famous writers, co-translated with Vo Ha Lang and Cam Vinh (VN: Phuong Giang, (? ), second edition 1957), “Vien Ngoc Trai”, translation of “The Pearl” by John Steinbeck (VN: Thu Tu Tuan San, 1967), “Tra dao”, translation of “The Book of Tea” by Okakura Kakuzo (VN: La Boi, 1967), “Cuoc doi bac si Arrowsmith”, translation of “Arrowsmith” by Harry Sinclair Lewis (VN: Quoc Bao, 1970), and “Mac cho gio dap tuyet vui”, translation of “Let the hurricane roar” by Rose Wilder Lane (co-translated with Cam Vinh, VN: Quoc Bao, 1960), among the others. Truong Bao Son died of natural cause at Institut Universitaire de Geriatrie de Montreal Canada where he had been living. (From the guidelines: … Although the biographical introductions to contributing poets, writers, translators and artists are mostly based on the curriculum vitas submitted by contributors, please be advised that the contributor should not expect TWP to have its introduction saying exactly what the contributor wants to say. In any case the contributor should not expect that he could give an editorial opinion on the introduction to the contributor written by The Writers Post. The editor reserves the right to refuse the contributor’s suggestion that certain information should be added from the submitted CV, and the right to omit certain information, even if it is factual. Also, please be advised that all biographical introductions to contributors published in The Writers Post are The Writers Post’s properties, copyrighted by The Writers Post, and cannot be in any ways and means reused by the contributor or anyone). HONG KHAC KIM MAI, born a descendant of Hong Tu Toan --Thai Binh Thien Quoc on 10-15-1945, educated at College Français de Tourane (Da-Nang), Lycee Marie Curie (Saigon), and Faculty of Letters – University of Saigon (where she joined the student association of which she was later one of the acknowledge leaders), and SU (US), and afterwards became a professor of Vietnamese literature, and a teacher of piano-playing, at various French Colleges in South Vietnam. Hong Khac Kim Mai escaped Vietnam with her children, and resettled in 1977 in the US, where she became a System Analyst (Oregon, Health Department) and a Data Processing Consultant (DASD). After 1999, she abandoned her job to live her secluded life, and devoted most of her time to her literary pursuits. At the age of 15 Hong Khac Kim Mai started composing poetry, in French and Vietnamese, under her real name Hong Khac Kim Mai. Her poems first appeared in the literary magazine Pho Thong which was then under the editorship of the late poet Nguyen Vy. Her poetry collection Mat Mau Nau published in 1965 interested many intellectual readers in Saigon, and brought her into public notice, before came under attacks for being a work of decadent culture, and was banned by the after-1975 government. Mat Mau Nau, the work for which she was best known, was followed by Nhu Phu Van (poetry), Vo Thap (science fiction). Hong Khac Kim Mai writes in Vietnamese language, and recently in English. 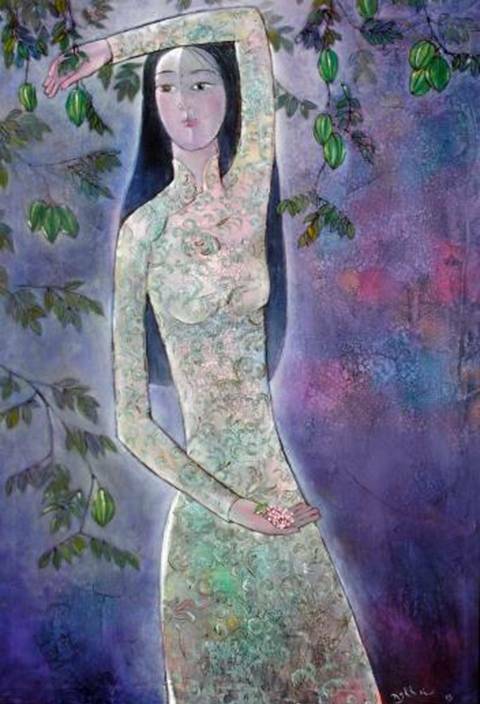 Hong Khac Kim Mai is a woman of broad cultural interests. She composes music and spends time on painting. Tim Noi Suoi Thuong is her collection of songs. In the US, her poems and short stories appeared in the established literary magazines: The Ky 21, Van Hoc, Van, Song Van, Wordbridge, Tap Chi Tho, and recently the new monthly Nguon published in California. The short story “As if no one there” published in this issue was submitted to The Writers Post and the print Wordbridge in 2008. (TWP and Wordbridge are under the same editorship). It was scheduled for publication in both magazines. Unfortunately, due to the editor’s ailing heath condition, the publication of the print Wordbridge has subsequently been canceled and The Writers Post has decided to temporarily postpone the publication of the story. The story, however, simultaneously submitted, was already published in another literary magazine. Christopher Barnes is living in Newcastle, UK. VU DINH DINH was born and grew up in Vietnam. Pursuing higher education he came to the US in 1956 and attended the University of North Carolina at Chapel Hill, University of Chicago, and University of Hawaii where he obtained his Ph.D. He was recipient of an East-West Center Grant, a National Endowment for the Humanities Grant, and a National Science Foundation Honorable Mention Award, and having served as Senior Heath Planner with the Houston Department of Health and Human Services, taught at the college level, and had scientific research works published in international journals. His publications on Vietnamese culture include “In Search of a Tradition Code of Behavior and Cochinchina: Reassessment of the Origin and Use of a Westernized Place Name”. In 2001, his ‘Selected Vietnamese Poetry’ was published by R&M (Stafford, Texas: R&M, 2001). Published bilingually, the book includes 100 original poems in Vietnamese language he selected, and 100 translation versions he translated into English. The poems, which cover a period of more than one thousand years beginning with Ly Thuong Kiet’s dating from 1077 when this General repelled the Tong invasion (from China), range over various topics taken as the translator’s main focus of human love and passions: the beloved land, patriotic appeals, family ties, and human nature. The article “Proclamation of Victory: Translation and Annotations of a Fifteenth Century Vietnamese Document” published in this issue is Vu Dinh Dinh’s most recent writing. The “Proclamation of Victory” is a public notice, written by Nguyen Trai (1380–1442), after the Vietnam’s victory in the war of defense against China led by Le Loi at the beginning of the 15th century. The proclamation, as well as Nguyen Trai’s shrewd advice on military strategy and tactics helping to keep Le Loi’s uprising on course, and a large number of his diplomat letters that encouraged the enemy to negotiate a peace, his manuscripts in verse and prose that expressed the conception of humanity and love of nature, all have brought him fame, made him a statesman of talent, a great historic and cultural figure. It is believed that without Nguyen Trai, a talented strategist and tactician, Le Loi was not supposed to have won the battle. The proclamation is the reflection not just of the King’s heroism, his victory, but also of Nguyen Trai’s dignity, his thoughts of humanity and justice, his philosophy of life, and more importantly the voice of the whole nation, the national identity, the desire for freedom and peace, the indomitable spirit of the Dai Viet people of that period. He has been honored as one of the greatest of all time. Duong Quang Ham, in “Viet Nam Van Hoc Su Yeu” (1943), honored Nguyen Trai as a distinguished leading writer in Le Dynasty; Bui Huy Bich, in “Lu Trung Tap Thuyet”, honored Nguyen Trai as an outstanding poet at the beginning of 15th century; Duong Dinh Ngo The Vinh wrote in “Uc Trai Di Tap” published in 1868 that Nguyen Trai’s literary works could be compared with what is the greatest in heaven and earth; and Nguyen Thien Thu while studying on the influence of Nguyen Trai on Vietnamese literature stated that “Quoc Am Thi Tap” did open the new path for Vietnamese poetry (Nguyen Trai, Saigon: Lua Thieng, 1973). Before the fall of Saigon in 1975, historical materials, books and articles on or related to Nguyen Trai published in South Viet Nam include works by Pham The Ngu, Viet Nam van hoc su gian uoc tan bien (Saigon: Quoc Hoc tung thu, 1961-1965); Pham Van Son, Viet su Tan Bien. Q. II: Tran Le Thoi dai (Saigon: Van Huu, A Chau, 1959); Pham Van Dieu, Van hoc Viet Nam (Saigon: Tan Viet, 1960); Thanh Lang, Ban luoc do van hoc Viet Nam (Saigon: Trinh Bay, 1967): Quyen thuong, 97-104; Thanh Lang, Van chuong chu Nom (Saigon: [? ], 1957); Thanh Lang, Van hoc Viet Nam: the he dan than yeu doi (Saigon: Phong Trao Van Hoa, 1969), Chuong I; Ha Nhu Chi, Viet Nam Thi Van giang luan (Saigon: Tan Viet, [? ]), 94-113; Pham Van Son, “Tam su cua Nguyen Trai qua thi ca,” Van Hoa Nguyet San 9 (Saigon, 1964): 1156-1163; Pham Van Son, “Vu ran bao oan thoi Le so”, Pho Thong magazine 145 (Saigon: 1965): 46-53, 146 (? ): 23-29; Thach Trung Gia, “Ngay nay con khai thac duoc gi o tinh than Nguyen Trai”, Minh Duc (Saigon: 1974); Tran Tuong Niem, “Ban ve bai Tu Than cua Nguyen Trai,” Pho Thong magazine 44, (Saigon: 1960): 14-20; Nguyen Khac Kham, Thai Bach, and Pham Dinh Tan, “Vai nghi van trong than the va tac pham van hoc cua Nguyen Trai,” Van Dan magazine 10 (Saigon: 1962): 3-18: This is a special issue about Nguyen Trai, in which a scholarly discussion about Nguyen Trai between Nguyen Khac Kham, Thai Bach, Pham Dinh Tan, and Nguyen Trai’s descendents held on November 11, 1963 at Van Dan magazine was published. Dr. Vu Dinh Dinh’s article, besides the translation and annotations, focuses on the whole question of “why present generations of Vietnamese gave full credit to Nguyen Trai, who wrote the proclamation at the king’s order, while almost completely ignoring Le Loi as the major participating player in the issue of the proclamation”. While attempting the task of crediting Le Loi with his revolt and victory over the enemy, and his participation in the proclamation on which he gave no further discussion except the footnote 70 to Bui Ky’s translation version which tried to back his view, Dr. Dinh came up with what most researchers on Nguyen Trai may consider not factual: Nguyen Trai has been given “full credit” to the proclamation and emphasized just for an image of a national hero the communist-led government of North Vietnam had been in need of. The article will very likely start debate. There is a sure sign of a political propaganda in which Nguyen Trai has recently skillfully been used for political purposes, but it is not by any means that one can say that owning to those political purposes Nguyen Trai is promoted to being any more important than he has ever been. Nguyen Trai, so great as he is, won’t need any political movement to be the greatest of all cases. Among the sheer quantity of more than 250 historical materials, books and researches on or related to Nguyen Trai (“Nguyen Trai, khi phach va tinh hoa cua dan toc” published by Vien Van Hoc Ha Noi in 1980 listed 252 items), a small quantity of titles serving political purposes published by governmental institutes, and some books or articles intended for political or social benefits by opportunist writers are not of great significant contribution to the admiration for the historically praiseworthy Nguyen Trai. The Writers Post, as always, maintains objectivity and will provide as much space as possible for scholarly discussion as mentioned in the editor’s note at the beginning of the front page of every The Writers Post’s issue: “The writers published in The Writers Post express their readiness to discuss any issues they wrote, and The Writers Post would like to print any response, especially to criticism, for other point of view”. JOHN TZIKAS, a graduate of Guelph University in Bachelor of Art, and Lakehead in Bachelor of Education, a Toronto based poet, and lyricist who wrote poems and performed a numerous poetry readings while working as a competent mild mannered salesperson. His poems have appeared in Ditch Poetry, Quills, Long Story Short, among the others. He is currently living in Toronto, Canada. DIEP TRUNG HA, a graduate of the University of California with BS, BA, MS, and PhD in Engineering, Mathematics, Physics, and Physics respectively. He began his writing in 1998, wrote his own poems and started translating poetry. Volumes of his translation include the poetry translated from his native language, Vietnamese, into English; and from foreign languages, Chinese and Spanish, into Vietnamese. His Haiku poems, contemporary poems, and translations have chiefly appeared in Firmament, an electronic magazine published by the literary group The Huu Van Dan. Diep Trung Ha is currently living in the US. DU TU LE, pseudonym of Lê Cự Phách, born in 1942 in Ha Nam. The Geneva Accord in 1954 forced him to immigrate, with his brother, to South Vietnam, where he settled in Hoi An, Quang Nam, then later in Da Nang. Coming to Saigon in 1956, he pursued education at the high schools Tran Luc, Chu Van An, and the Saigon University Faculty of Letters. He joined the Army of the Republic of Vietnam (ARV), graduated as an officer from Thu Duc Military Academy, Course 13, and worked at the Psychological Warfare Department as a war correspondent and the managing editor of the ARV’s Tien Phong Magazine. In 1969, he was sent to a training seminar in basic journalism in Indianapolis City, Indiana. As a result of the 1975 events, he came to the US, and resettled in California in April 1975. Du Tu Le started composing and publishing poetry at an early age, in 1953, under many different pseudonyms. The pseudonym Du Tu Le was initially used for a poem published in Mai magazine in Saigon in 1958, and has since been the only pseudonym under his books. His poems has appeared in a number of Vietnamese-language literary magazines at home and abroad before and after 1975, and in the Los Angeles Times in 1983, the New York Times in 1996, the anthology World Poetry / An anthology of Verse From Antiquity To Our Time (New York: Norton) in 1998; also, his poems appeared in some universities’ textbooks since 1990, or used in some universities for education purpose. Jean-Claude-Pomonti, a leading writer for the Le Monde, had chosen one of his poems to translate into French, and had it published in La Rage D’Etre Vietnamien. Du Tử Lê was once mentioned by the late writer Mai Thao as one of the distinguished poets in the Vietnamese contemporary literature; the others are: Vu Hoang Chuong, Dinh Hung, Bui Giang, Nguyen Sa, Thanh Tam Tuyen, and To Thuy Yen. Du Tu Le is the author of more than 40 books. His eponymous debut collection of poems ‘Tho Du Tu Le’ was published in 1964, his most recent ‘[neu can,] hay cho bai thoú mot ten goi !? !’ published in 2006 by HT Productions. “Only you know: never have I aged, till loving you do I grow, awfully tall” published in this issue is a translation version taken from the poetry collection ‘Flowers can’t believe fruits would grow that bitter! Hoa nao tin qua dang den khong ngo!’ translated by Nhu Hanh, published by Nhan Chung (US: Nhan Chung, 1999). THANH TON, pseudonym of Le Thanh Ton, born on 09-09-1943 in Loc Phuoc, Dai Loc, Quang Nam. Having been mobilized he served in South Vietnam’s Armed Force. After the fall of Saigon in 1975, he was arrested, and sent to a hard labour camp for seven years from 1975 to 1982. Thanh Ton immigrated to the US in 1997, where he resettled. He published his debut collection of poetry “Tinh Nguoi Song Thu” in 1964 (for private circulation in a limited edition, co-authored with Hoang Quy and Thai Tu Hap), which was followed by Thap Tinh (Nguong Cua, 1969). Thanh Ton' s short stories and poems appeared in many literary magazines published in Vietnam before 1975. LU QUYNH, writer and poet, born in 1942 in Thua Thien, Hue, Vietnam. His works appeared, before 1975, in the literary magazines published in South Vietnam, including Bach Khoa, Mai, Pho Thong, Khoi Hanh, and Y Thuc. His publications include Cat Vang, a collection of short stories, published by Y Thuc in Saigon in 1971, the second edition was published by Van Moi in California (US) in 2006; Song Suong Mu, a collection of short stories, published by Y Thuc in 1973; Nhung Con Mua Mua Dong, a novella, published by Nam Giao in 1974, second edition by Thu Quan Ban Thao in 2010; and Vuon Trai Dang, a novel, published periodically in Y Thuc magazine from 1971 to 1972. He settled in the US, and resumed his writing after 2001, contributing to Van Hoc, Khoi Hanh. His most recent collection of poems, “Sinh nhat cua mot nguoi khong con tre”, is published by Van Moi in 2009 (California: Van Moi, 2009). Lu Quynh is now living in California. Mai Van Phan, born in 1955 in Ninh Binh, Red River Delta, North Vietnam, member of Vietnam Writer’s Association, winner of some awards for poetry in the provincial and national competition. Mai Van Phan’s Giot Nang (Sun Drop), a collection of poems published by Hoi Van Hoc Nghe Thuat Thanh Pho Hai Phong /The Literature and Arts Association of Hai Phong City’ in 1992, was followed by Goi Xanh /Calling Green poetry collection (Vietnam: Hoi Nha Van Vietnam /Vietnam Writer’s Association, 1995), Cau Nguyen Ban Mai (Morning Prayer – poetry collection. Hai Phong, Vietnam: Hai Phong Publisher, 1997), Nghi Le Nhan Ten (Name Giving Ceremony – poetry collection. Hai Phong, Vietnam: Hai Phong Publisher, 1999), Nguoi Cung Thoi (People in the same Era – epic. Hai Phong, Vietnam: Hai Phong Publisher, 1999), Vach Nuoc (Water wattle - poetry collection. Hai Phong, Vietnam: Hai Phong Publisher, 2003). His poems also appeared in more than 30 anthologies, including FULCRUM 3 published in the US; in many journals published in Vietnam, including the monthly VAN of the Vietnam Writer’s Association of Ho Chi Minh City, which is under the editorship of Anh Duc, editorial address: 81 Tran Quoc Thao – Q.3 – TP. Ho Chi Minh (Anh da roi, Van: Xuan Mau Dan 1998, Thanh pho Ho Chi Minh 12.1997 – 1.1998); and in the magazines and Vietnamese language websites published abroad, including “Thi Luan” Magazine (S. Korean) and TIEN VE, an online centre for literature and the arts, based in Australia. Do Xuan Oanh, born in Quang Yen, Quang Ninh Province, North Vietnam on January 4, 1923, into a poor worker family of the coalmine area; self-educated and became a jack-of-all-trades – journalist, painter, writer, social worker, songwriter, translator, peace activist etc. Joining the revolution before 1945, he wrote the famous Nineteen August song on the August 1945 General Uprising Day, and subsequently many songs and music works during the wars. In the translation field, he translated into Vietnamese many American novels, including Mark Twain’s Huckleberry Finn first published in Vietnam. Into English he translated the play Truong Ba’s Soul in the Butcher’s Skin to be performed in America. For a while he joined the Vietnam Peace Committee and Vietnam-US Society as Vice-chairman and General Secretary. As a people’s diplomat representing social organisations, he worked with the Vietnam delegation in Vietnam-US Paris Peace Talks from 1968 to 1973. He retired in 1990 to continue with music and translation works. NGUYEN THI THANH BINH, fiction writer and poet. Her most recent book is Dau An, a collection of short stories published by Van Moi Publisher (2004). This is the fifth book of the author, after Tron Vao Giac Mo Em, a collection of poetry published by Thanh Van Publisher (1997), O Doi Song Nay (a collection of short stories) published by Dai Nam Publisher (1989), Giot Le Xe Hai (a novel) published by Van Khoa Publisher, and Cuoi Dem Dai (a collection of short stories) published by An Tiem Publisher (1993). Her poems have appeared in numerous magazines, one of her short stories has been anthologized in "Tho van hai ngoai nam 2000" (CA: Van Moi Publisher, 2000). Nguyen Thi Thanh Binh is the editor of Gio Van, a literary magazine founded in 2002 in the US. TAN DA, pseudonym of Nguyen Khac Hieu (1889-1939), a prolific Vietnamese poet, writer, playwright and translator who was born in 1889 into a famous family― his father is a mandarin, his mother a renowned singer. Living in the literature renovation period, in which modern Vietnamese that is written with Latin alphabets introduced in 17th century, and subsequently improved by the French missionary Alexandre de Rhodes, Tan Da witnessed the moribund Chinese study and the new script called “chu quoc ngu” quickly gaining popularity and replacing the old writing system modelled on Chinese characters. Equipped with the knowledge of “chu quoc ngu” obtained through his higher education in Tan Quy college after 14 years of studying Chinese in his own village, Tan Da started his literary career with works published in Dong Duong Tap Chi, which was then under the editorship of Nguyen Van Vinh. The magazine’s premier issue launched on May 15, 1913, four years before the publication of Nam Phong magazine (founded by Pham Quynh and Nguyen Ba Trac, published in 1917). Its aim is twofold: serving as a compromise between East and West literature via translation, creating a movement for renovation of Vietnamese literature, including using the new romanized character as a renovation of writing form. As a translator, Tan Da translated “Kinh Thi”, “Dai Hoc”, “Quoc Su Huan Mong” from Chinese into Vietnamese published by “Tan Da Thu Diem” which he co-founded with Nghiem Thuong Van and Dang Duc To in Hang Gai Street, Hanoi Province. Also, he co-translated Ty Ba Ky with Doan Tu Thuat. In 1925, he founded and edited the magazine “An Nam Tap chi”. Although discontinued several times, the magazine contributed significantly to Vietnamese literature at that period. As playwright, he wrote two plays Tay Thi and “Luu Nguyen nhap thien thai”. After the publication of his “Giac mong lon” in 1929, Tan Da translated Duong Thi (Chinese poetry) for Ngay Nay magazine published by Tu Luc Van Doan, annotated Kim Van Kieu and translated “Lieu Trai Chi Di” for Tan Dan Publisher. At the same time, he worked as editor of Thi Dan, a poetry section in Tieu Thuyet Tuan San magazine. In Saigon, he worked for Dong Phap Thoi Bao published by Diep Van Ky. His publications include Khoi tinh con, Khoi tinh, Len sau, Len tam, Dai guong, Giac mong con, and a number of works of verse and prose published in the magazines above-mentioned. Tan Da is best known for his poetry and poetry translation. For his poetry translation from Chinese into Vietnamese, he is recognized master of the field. But his life was dogged by grinding poverty. At the end of his life, he advertised in several magazines published in Hanoi: “work for hire-- writing for hire about any topics, for any occasion…” With that, he is believed to be the first ghostwriter by career in Vietnam. He died in Hanoi, aged 51. The Writers Post is working to bring the audience more of English translations of Tan Da’s works in a future issue. N. SAOMAI [photograph 1989, US], author and editor, born in 1940 in Quang Ngai where he lived for 7 months before being brought to Saigon, grew up in Saigon, Dalat, and Nhatrang. He started his writing in the early sixties, contributed miscellaneous essays and general journalism to Saigon-based daily newspapers as a freelance writer. Also, from 1968 to 1972, he was on the editorial board of the monthly Nuoc-Ta, wrote stories, poems, and essays under his real name and pseudonym Phuong-Thao. He began to write novel in 1962, and completed four novels (written in the period from 1962 to 1975), which remained unpublished during the Viet-Nam war. 'Can Nha', a novel having got past the military government's censors of the press, been ready to be published in 1974, was published 23 years later in the US. He left Viet Nam on April 29th 1975, one day before the fall of Saigon on April 30 via a Chinook piloted by his brother, escaped Saigon for the sea and landed on the U.S.S. Duluth (LPD6) of the 7th Fleet which was then outside Vung Tau’s territorial waters, with his three motherless children. One of them later became Tap-chi Song-Van’s managing editor Thanh-Tam. He came to the US in May 1975, settled in Miami in June 1975. Can Nha, published periodically in Tap-chi Song-Van (ISSN 1089-8123), and in book form in December 1997, is his third novel. Several excerpts from the novel were republished in the literary Van (CA: Van, issue 35, November 1999), and in the anthology Tho Van Hai Ngai Nam 2000 (CAN: Viet Thuong, 2000). His second 'Bon no le trong den tho', written on the starting date of 1964, was also published periodically in Tap-chi Song-Van, issue 15. This was the last issue before the discontinuity of the magazine in December 1999. One excerpt from his fourth novel (1973) was published in Gio Van magazine. N. Saomai is the founder, publisher, and editor-in-chief of the magazines Tap-chi Song-Van [ISSN: 1089-8123], The Writers Post at http://www.thewriterspost.net [ISSN: 1527-5469]), and Wordbridge [ISSN: 1540-1723). As a founder and editor of the magazines aiming to introduce Vietnamese literature into Western literary communities, he brought through his translations a number of new and established Vietnamese poets and writers to an English speaking audience. The translation versions were published in Tap-chi Song-Van, The Writers Post, and Wordbridge. added accordingly among the others published in the same year (some exceptions may be made for books published in Vietnam). A collection of Sweden poetry translations, translated Bang Viet, Chau Dien, Ho Bat Khuat, Hoang Hung, Hoang Tuan Anh, Mimmi Dieu Huong, Ngan Xuyen, Nghiem Huyen Vu, Ngo Tu Lap, Nguyen Hoang Dieu Thuy, Nguyen Van Dan, Nguyen Xuan Sanh, Phan Trieu Hai, Quang Chien. (Paris, France: Que Me, 2009). by five authors Bien Bac, Bim, Thien Dang, Nguyen Tat Do, and Giang Anh Ien. (VN: Nha xuat ban Tho Tan Hinh Thuc, 2008). to raise money for the Medical Aid (Afghanistan) appeal of the Glasgow-based charity Spirit Aid, which is an entirely volunteer run organisation, headed by Scottish actor and director, David Hayman. The 44th book of the author, a collection of poems written from 2000 to 2006 published by HT Productions in August 2006. The score to the Charles- Bukowski’s-novel-based film “Factotum” was composed by the renowned Norwegian singer & songwriter Kristin Asbjornsen, in which she performed two poems by Bulowski. In addition to the music from the film, the soundtrack contains two more songs based on poems by Bukowski taken from ‘What matter most is how well you walk through the fire’. The CD is available from Milan Entertainment, Inc. beginning August 1st. author of Giot Nang (Sun Drop), Goi Xanh (Calling Green), Cau Nguyen Ban Mai (Morning Prayer), Nghi Le Nhan Ten (Name Giving), Nguoi Cung Thoi (People in the same Era).